Spring break is winding down and students will be back on Monday. Be sure and take a moment to relax prior to Monday. From now until commencement it will be go, go, go. I thought I would share some project updates with you so you are ready to go next week. SACSCOC Visit: Next week, an accreditation review team from the Southeastern Association and Colleges and Schools (SACS) will be visiting Clemson to conduct our five-year review. They appear to be focusing on new programs and locations at Greenville and Greenwood. The Libraries have been asked to provide information to the review team regarding how we serve students and faculty at these remote locations. Jan, Jennifer and Jenessa, who are the liaisons to the programs in question, will be on hand to meet the reviewers. I will be in Greenville that day as well. Thanks to the three of them and Anne for coordinating our responses. This points out one issue we need to work on next year. We need to come up with a coordinated plan of service for Clemson’s locations across the state so that students and faculty have access to the same materials and services that they do on campus. This need was previously identified in the Libraries Forward plan. Libraries Undergraduate Fee Increase: The Libraries receive money from three library fees – undergraduate, graduate and summer. The current fee for undergraduates is $85 per semester; graduate students and summer session student pay $120 per semester. Fee monies have been used to support library collections. We are proposing an undergraduate fee increase of $15 to $100 per semester. My goal is eventually to bring the undergraduate fee in line with the other fees. This increase would cover the costs of inflation which, without additional revenue, would cause us to have to cut journal subscriptions. This increase will also provide additional resources for facilities upgrades and staffing. While cognizant that increases in fees impacts student success at Clemson, we’re stuck as we have no other guaranteed revenue sources. I have made a proposal at the Provost’s request to add annual inflation increases to the University budget. There is no guarantee of this now. If that moves forward, that would limit the need to increase student fees in the future. 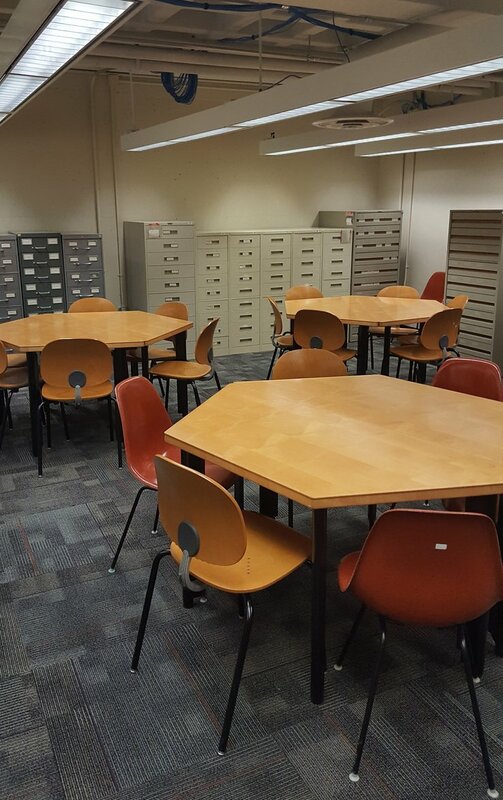 University Press Move: I met with the Libraries’ Advisory Committee of the faculty earlier this week to discuss issues related to the Press Director’s status as Lecturer or Assistant Librarian. Next steps include meeting with the Libraries’ Faculty Tenure and Promotion Committee as well as the faculty as a whole to get their advice. Teri and I are working on finding a location for them in Cooper and I am working with Karen to get the budgets transferred. Press members John and Alison will be coming to the Libraries later this semester to introduce themselves and answer questions so we can learn more about what they do and discuss synergies. Submission of Theses and Dissertations through TigerPrints: I have been working with Chris Vinson, Kirstin O’Keefe, and the administration in the Grad College to explore moving away from having students submit their theses and dissertation to ProQuest but rather have them submit them directly to TigerPrints. My understanding is that this is something the Libraries have been working on for about 7 years – Andy Wesolek had been taking lead previously. While ProQuest has some advantages – you can search all thesis and dissertations from one database – it is not very useful as a management tool. Right now, students need to maneuver a 23-page manual to upload their content to ProQuest. In order for us to get the metadata from ProQuest to TigerPrints, Scott has written lines and lines of code that need to be updated on a regular basis. By moving to TigerPrints, following in the footsteps on NC State, University of Georgia and LSU who have already moved in this direction, we have more control over the submission, metadata fields, and content access than we do now. Another benefit – there have been embargo issues with ProQuest which have made patentable content available to the world. We’ll be able to control this better in TigerPrints. Lastly, once we move to Alma, all thesis and dissertations in ProQuest and in TigerPrints will be searchable from one interface – and they’ll also show up in Google. We have a tentative agreement with the Grad School to move forward with this with a fall or spring 2020 implementation. We’ll be having more discussions about how this transition would occur as more details are worked out. Facilities Update: Teri provided me with some facilities content to share with you. One change you may have noticed are the map and microfilm case moves that occurred on Wednesday. Both collections are now on first floor. Pictures of the open space and new location are attached at the bottom of this update. On completion of the journal move task force work, the entire sixth floor will be opened up by removing the then empty ranges. Additional electrical will be provided to the columns spread throughout the floor. New carpet will be installed (carpet to match 1st, 2nd & 6th floor). Some existing study tables will remain; however we will test out varying furniture types to increase seating. The current seating on 6th floor allows for 180 students and we hope to double that count if not triple it. At this point we are soliciting furniture proposals from two companies on state contract and would be happy to share the proposals when received. 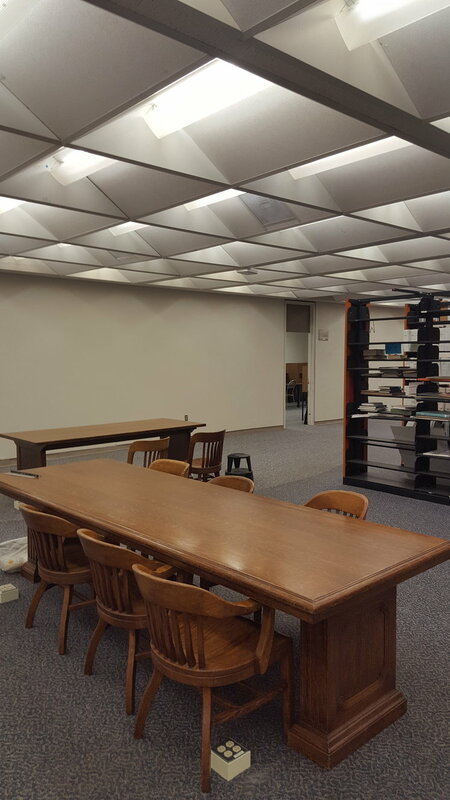 Ideas for renovating and improving space on the third floor are fluid at this point. As is true for 6th floor, we want to maximize seating. The government documents crew is doing a fantastic job in decreasing the footprint of the print collections in order to open up space. 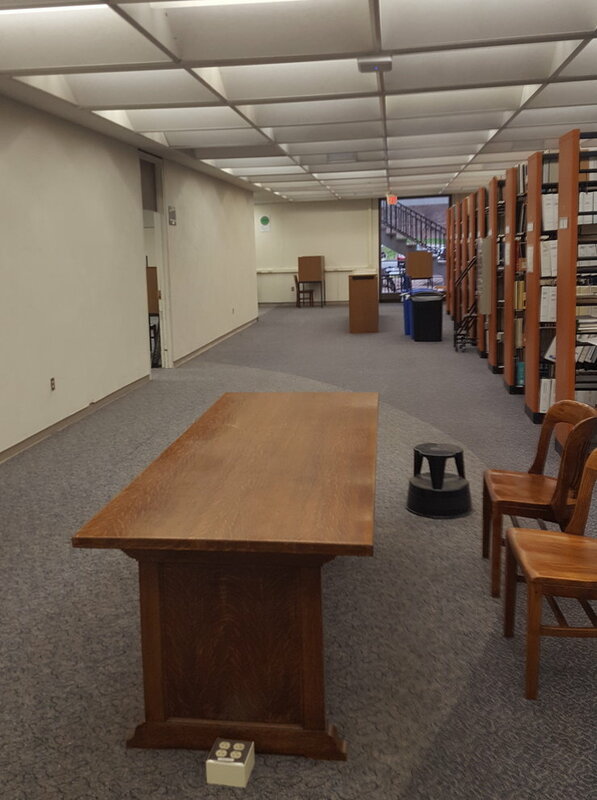 The children’s/young adult collection will likely move to 301/301a with a dual purpose to create a better space for the materials but also provide tables and seating for study. This move will free up even more floor space in the common area. As mentioned above, the map cases and fiche are little used collections and a move to 107 & 108 will free up even more space. 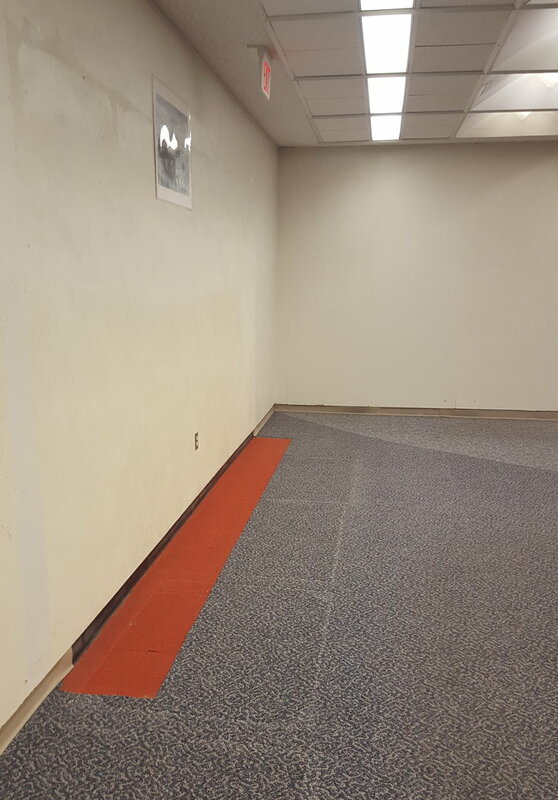 Student Government is funding electrical improvements to start after exams by adding core drills and more power to the columns in the now open common spaces. 401 Byrnes Room received a bit of a facelift as new furniture arrived last week. Check it out. 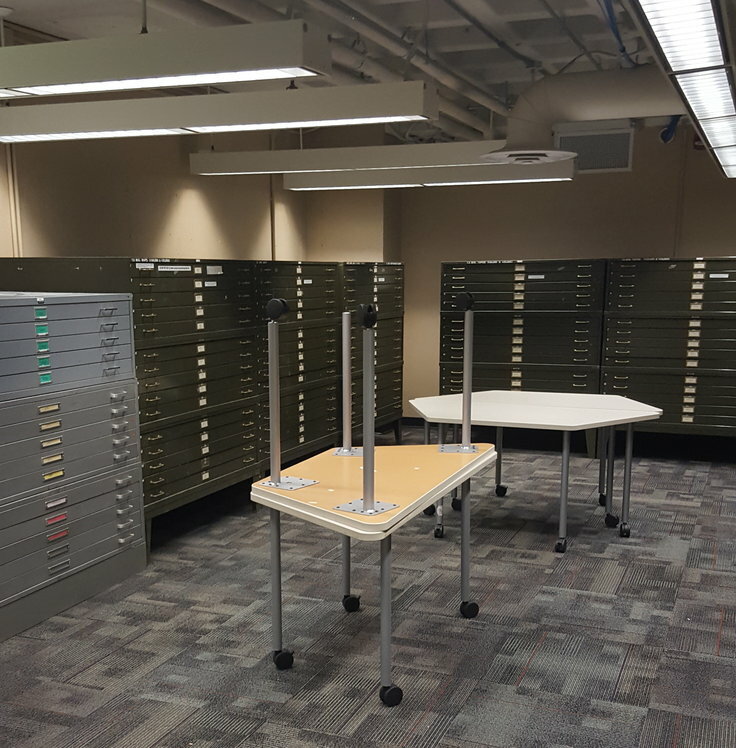 Tables and chairs are easily moved and re-configured. We anticipate the room will be used for special activities and events. It will remain open for study space when not used for events. 416 Brown Room – a change in the use of space – rather than have an empty room, we anticipate more special events and activities to take place in this room as well. 411 Circulation Office will receive new panels and a door for added security. Timeline not yet known. 201A Sigma Alpha Zeta Room will receive an upgrade in technology and equipment. Timeline not yet known. Plan to install a PA system in Cooper is progressing albeit slowly as the University seeks an appropriate product that meets all codes and allows for future technology. Project to renovate the 4th floor single use toilets is tentatively scheduled for summer 2019. These toilets located around the corner from the elevators will be fully functional ADA accessible toilets. University funded lighting upgrade is in planning stages. This project has moved slowly as technical issues surfaced with existing old light fixtures and controls. Some work may begin during the summer 2019. Presented to members of the Emeritus College sharing our current challenges and plans for the future. Along with Bob Freeman, meeting with folks at CU-ICAR this Tuesday to get a sense of what we are currently doing to support them and what they would like.